There is often much confusion amongst vehicle owners about the lights they are allowed to fit on their vehicles. Much of this is uncertainty pertaining to the terminology of what a headlamp is and what a spotlight would be. Vehicle owners often refer to extra lamps attached to the front of the vehicle as spot lamps where they are in fact not spotlights. A spot lamp is adjustable and can only be attached to the vehicle of a doctor, emergency response and breakdown vehicle etc. As a general guide- where there are an extra set of headlamps, they are legal, if they can be adjusted they are not legal. These lamps are a set of fixed lamps and as long as it complies with the headlamp requirements it should be legal. They are not spotted lights. Herewith a closer look at some of the Regulations pertaining to headlamps. (ii) the side-car is equipped with one parking lamp which complies with the provisions of regulation 164 or with one headlamp contemplated in paragraph (b)(i), subject to the proviso to regulation 161(4)(a). 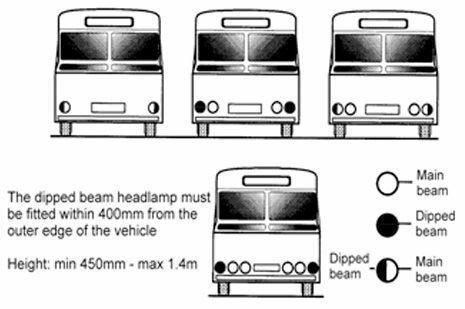 (2) At least one headlamp contemplated in sub-regulation (1)(a) capable of emitting a dipped-beam or a parking lamp complying with the provisions of regulation 164 shall be so fitted on each side of the longitudinal centre-line of the motor vehicle concerned that the portion of the illuminating surface thereof furthest from the longitudinal centre-line of the motor vehicle is not more than 400 millimetres from the outer edge of the front of the motor vehicle. 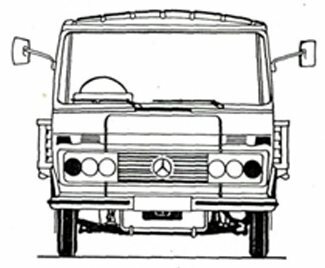 (3) The main-beam and dipped-beam of a headlamp fitted to a motor vehicle first registered on or after 1 January 2002, shall comply with the requirements of standard specification SABS 1046 “Motor vehicle safety specification for lights and light-signalling devices installed on motor vehicles and trailers”, and standard specification SABS 1376 “Lights for motor vehicles”, Part 2: “Headlights”. (b) it can be extinguished by the use of a device which simultaneously shall cause or allow the dipped-beam of light to be emitted or continue to be emitted from a headlamp. (c) “L” represents the distance in metres of the screen contemplated in sub-regulation (1) measured horizontally from the headlamp as illustrated hereunder. 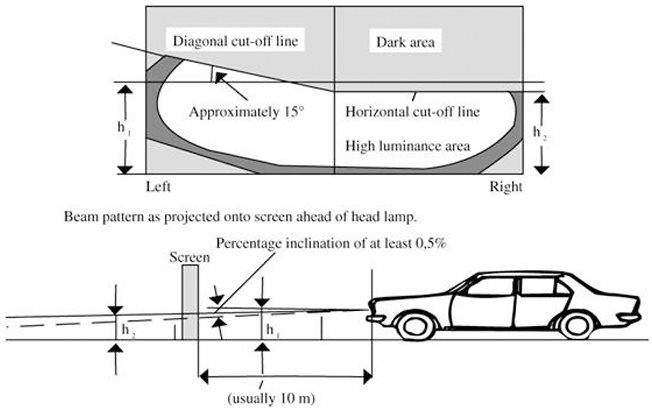 (3) Every headlamp emitting a dipped-beam of light which, when projected onto a vertical screen, shows a symmetrical light-pattern or does not have a diagonal and horizontal cut-off line, shall be so adjusted and maintained that when the motor vehicle concerned is on a reasonably level road, the centre of the intense part of such beam shall slant downwards to strike the road surface ahead of the motor vehicle within a distance not exceeding 45 metres. (c) the intersection of the diagonal and horizontal cut-off lines of a dipped-beam referred to in sub-regulation (1), or the centre of the intense part of a dipped beam referred to in sub-regulation (3), shall not deflect to the right. 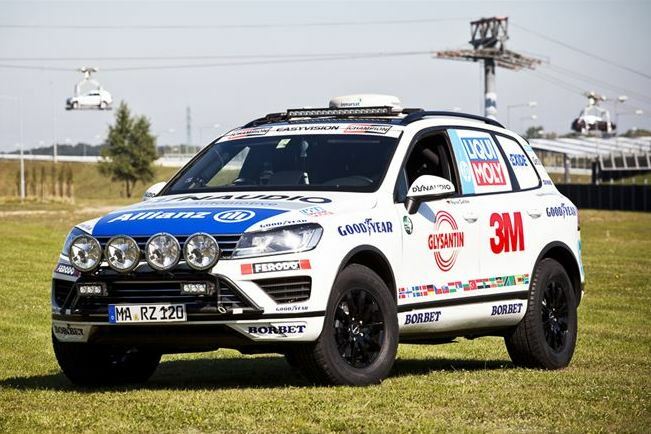 (c) may be fitted to a breakdown vehicle or a vehicle employed in connection with the supply of electricity or other public essential services: Provided that it is used solely at the scene of an accident or breakdown or for the examination of overhead telephone, telegraph or power lines. No lamp other than a lamp prescribed or authorised in terms of these regulations shall at any time be fitted to any vehicle operated on a public road. 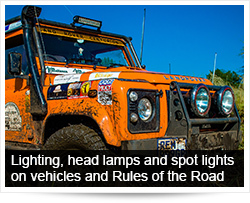 It is important to keep in mind that there is a set of SABS specifications to comply with when adding additional lights to the vehicle. As an example, it is stipulated that lights may not be attached at a height higher than 2.1m.  This is important for those considering attaching headlights to a roll bar. Best advice would be to check with your local licensing/traffic authority to ensure that your vehicle and the lights thereon are regarded and cleared as being road worthy.